one of the problems about being 108 years old is that when you bend over to remove a slice of pizza from the box your back can collapse. i havent worked out in two weeks and you’d think that your body would give you a break, but such are the penalties of decadence. 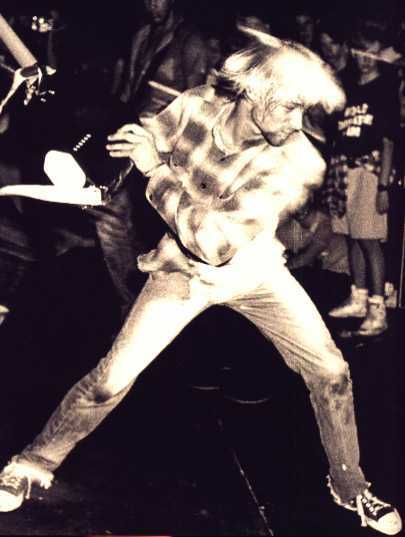 whenever i think of bad backs i think of kurt cobain because the word is that he had a bad back and a rotten stomach which is what eventually led him to heroin which led to him being dead in the ground. but right now i need vicodin like crazy, and oddly enough, but jeanine has the most amazing medicine cabinet, and today is st. patrick’s day which, oddly enough is our anniversary – eleven years ago we fell in love. (nine years ago she got over it) but anyway, jeanine was called, we wished each other happy anniversary and she said that she had no vicodin but these nurses who she totally went to vegas with last week and were all comped suites at the flamingo might have a few samples laying around. by the way, people of the world, i do have health insurance. i do have a good job that for a small fee gives me some of the best health insurance of all. but to get the vicodin i would have to go to the emergency room and sit in their seats for about 3 hours and then get charged $75 to probably get a prescription for Alleve, no vicodin for you. even though im an adult, and perfectly reasonable, and certainly not addicted to vicodin, thank you. and they tell you that things like vicodin could be addictive and i say, dating hot chicks could be addictive too, but you simply dont fall in love with every girl you go out with. so im begining to wonder what someone has to do or who do they have to know to get the proper medications when they know in their heart that they could use them? and remember when i told you the value of friendships? the back is a tad better than yesterday but yesterday, it’s the reason you shouldnt feel sorry for me. yesterday i was totally dying and ashley was sleeping and she and i constantly fight over who will have control over my computer so i like to go on it when shes asleep and let her have it when shes up. but for some reason i had to put up a little something for the weekend and it turned out to be oh, about 50 pages. when i was done my back hated me. so i hated it back by throwing a little love at Baseball Blog 2002.
im sure someone passing by my window would see the Scientologists jogging around their complex, the weekend autobody shop workers using the band saw across my brick wall, and Ashley rubbing the sleep from her light blue eyes at 2:20pm and think that im just living the finest life of all times. and as soon as jeanine and those nurses and those vicadin arrive maybe i’ll float over your house and i’ll wave.